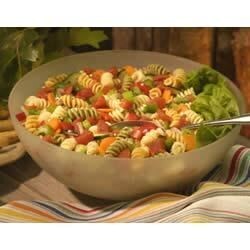 Recipe by: Red Gold®, Inc.
"This zesty pasta salad is bursting with flavor and is liberally dotted with lots of crunchy vegetables. Great recipe to take on a picnic and not worry about the warm weather affecting the safety of the salad." In a large pan cook pasta in boiling water until tender; rinse under cold water and drain. In a large bowl combine pasta, carrots, celery, peppers, cucumber, onion and RED GOLD(R) or REDPACK(R) DICED TOMATOES with BASIL, GARLIC & OREGANO. Pour dressing over mixture; toss until evenly coated. Chill until ready to serve. For another texture and flavor add 3/4 cup of shredded Mozzarella cheese before adding the dressing. To seed a cucumber, first halve it lengthwise. Use the tip of a spoon to scrape the seeds from each half. If you have a grapefruit spoon, you will find that the sharp tip works well for this task. The flavor was bland but the dish is beautiful...very colorful! Perfect... My family and I loved it. This was very good, but I thought the dressing was overkill so I used about 4 oz. instead. Good pasta salad. Standard. But nothing super-fancy. It lacked 'kick' so, I added pepperocino peppers. Tasted delish! This was really easy and very good! I didnt want to slice carrots so I bought shredded! I made this recipe for my daughter's graduation party last month and have been asked to make it twice since. It is excellent and has now "my" pasta salad to my family.